Samuel Umtiti set the hosts on their way after Kylian Mbappe's effort was parried by the Italian goalkeeper, Salvatore Sirigu. The French doubled their lead when Antoine Griezmann converted a penalty after Lucas Hernandez had been fouled. Leonardo Bonucci reduced the arrears for Italy but Ousmane Dembele's chip rounded off a fine French display. France beat the Republic of Ireland 2-0 on Monday. France have now won five and drawn one of the six games played between the two nations since Italy - who have failed to qualify for Russia - defeated them on penalties to win the World Cup final in 2006. While this was far from the level of that high stakes encounter in Berlin's Olympic Stadium, it did nevertheless prove a worthwhile exercise for France manager Didier Deschamps. With seven changes from the team that defeated the Republic of Ireland, Deschamps appeared to utilise the midfield and forward combinations to be deployed in France's World Cup opener against Australia on 16 June. Mbappe in particular sparkled in a fluent up-tempo display alongside Dembele and Griezmann and was given a standing ovation when he was replaced by Florian Thauvin late on. 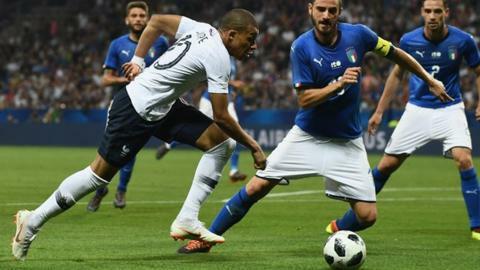 The pace, power and guile of that trio often left the Italian defence bewildered and the margin of victory might have been wider, with Dembele and N'Golo Kante both hitting the woodwork for France. Deschamps' side play their final pre-tournament friendly against the United States on 9 June before facing Australia in their World Cup opener a week later. Les Blues also face Peru on 21 June and Denmark on 26 June in Group C.
Italy's new head coach Roberto Mancini celebrated a 2-1 victory in his first game against Saudi Arabia on Monday but this was a step up in class for his team. The four-time World Cup winners are not at the finals for the first time in 60 years, and the deficiencies behind that absence were exposed by France. However, Mancini, who has brought Mario Balotelli back after a four-year international hiatus, believes his team can reach an equal footing within 12 months. "This can help to gain experience," he said. "Nobody likes to lose, ever, but there were moments where we had the chances to make it 2-2. "At this moment, unfortunately, France are superior to us and have so many players available to them. We must work and learn to get close to them, but we're on the right track. "Perhaps the most important thing is that the debutants did well and if we continue like this, in a year we'll be at their level, or close to it." Match ends, France 3, Italy 1. Second Half ends, France 3, Italy 1. Adil Rami (France) wins a free kick in the defensive half. Foul by Mattia Caldara (Italy). Substitution, Italy. Davide Zappacosta replaces Federico Chiesa. Foul by Benjamin Mendy (France). Federico Chiesa (Italy) wins a free kick on the right wing. Substitution, France. Steven N'Zonzi replaces Paul Pogba. Substitution, Italy. Andrea Belotti replaces Mario Balotelli. Corner, France. Conceded by Salvatore Sirigu. Attempt saved. Florian Thauvin (France) left footed shot from the centre of the box is saved in the bottom left corner. Assisted by Blaise Matuidi with a cross. Corner, Italy. Conceded by Samuel Umtiti. Substitution, France. Florian Thauvin replaces Kylian Mbappé. Paul Pogba (France) wins a free kick in the defensive half. Foul by Rolando Mandragora (Italy). Offside, Italy. Alessandro Florenzi tries a through ball, but Mario Balotelli is caught offside. Offside, France. Benjamin Pavard tries a through ball, but Kylian Mbappé is caught offside. Substitution, Italy. Giacomo Bonaventura replaces Jorginho. Foul by Thomas Lemar (France). Jorginho (Italy) wins a free kick in the defensive half. Substitution, France. Blaise Matuidi replaces Corentin Tolisso. Substitution, France. Olivier Giroud replaces Antoine Griezmann. Delay in match Mario Balotelli (Italy) because of an injury. Attempt missed. Mario Balotelli (Italy) right footed shot from the left side of the box is too high. Assisted by Lorenzo Insigne. Attempt missed. Paul Pogba (France) right footed shot from outside the box misses to the right. Substitution, Italy. Alessandro Florenzi replaces Danilo D'Ambrosio. Substitution, Italy. Lorenzo Insigne replaces Domenico Berardi. Substitution, France. Thomas Lemar replaces Ousmane Dembélé. Foul by Bryan Cristante (Italy). Attempt missed. Bryan Cristante (Italy) right footed shot from outside the box is close, but misses to the right. Assisted by Federico Chiesa. Attempt missed. Mario Balotelli (Italy) header from the centre of the box is just a bit too high. Assisted by Mattia De Sciglio with a cross. Foul by Ousmane Dembélé (France). Federico Chiesa (Italy) wins a free kick on the left wing. Corentin Tolisso (France) wins a free kick in the attacking half. Substitution, Italy. Bryan Cristante replaces Lorenzo Pellegrini.